Holds approximately 12 lbs. of mints or bulk candy - Includes salt and pepper shakers!! 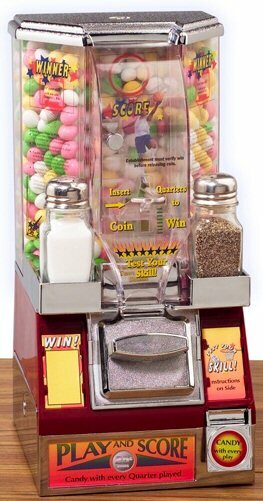 The Small Tabletop Candy Coin Shooter machine is a fun way to entertain any waiting customers while also making a profit! These machines are designed to be place on tabletops anywhere. The bright colors will attract customers of any age and the challenge of getting the coin through the designated slot will have people playing for hours. Place these machines in your restaurant, bar, diner, coffee shop. Anywhere there are people and a table, this candy coin shooter will be a hit. It only takes a quarter to play, and even if it doesn't make it in the hole the player will receive a prize. from Chiago, Il Anybody know which Tubular key these take? This was such a cute addition to our pop up event! We haven't had our event yet but think this will be a great hit for the kids to help draw them to our booth. Also customer service is STELLAR! Because we live in Hawaii shipping costs is a huge concern, I loved their patience with me as I tried to get the best deal for my shipping costs! Very sturdy design, adjustable hopper for product amount to be vended. Started with one, and said wow! I now have four units on my counter top at my bar. They take up little space and customers love them! With a vend every time, everyone is happy! I would recommend this this product highly. My first machine paid for itself and contents in less than 2 weeks! P.S. The added salt and pepper shakers on the side are ideal!